Home > The Group > Rimorchiatori Riuniti s.p.a. Via Ponte Reale, 2-4 fl. Rimorchiatori Riuniti was established in 1922 for operating its tugboats inside the commercial harbour of Genoa. After a pluriannual experience in this sector the company decided to expand its strategy establishing a company for the offshore sector. In 1981 Messrs Finarge Armamento Genovese Srl started the challenge in this field. 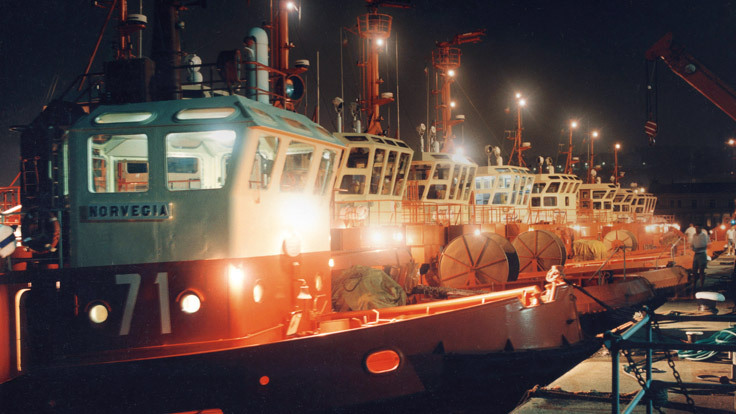 In 1987 it was decided to establish a new company called Rimorchiatori Riuniti Porto di Genova Srl to manage the harbour tugs of Genoa port. Having awarded the license for operating its tugs in Salerno was established in 1996 a new company named Rimorchiatori Salerno that manage three harbour tugs in this port. During these years Rimorchiatori expanded its strategies in other marine sectors. In 2002 they ordered, in a primary European shipyard, two containerships of 2.500 TEU each. In 2007, the company joined and won an international tender for the purchasing of the public company Tug Malta Ltda, provider of the harbor towage service in the harbor of Malta. In 2014, the company purchased the 50% of Gesmar S.p.A., leader in the harbor towage services in the Adriatic sea. Presently the Group represent the biggest Italian towage operator, and one of the first in the Mediterranean Sea. Rimorchiatori Riuniti spa has always been proud of staying on top of the service it provides, and has always been eager to ​comply with the latest safety developing standards.